Last week, Donald Trump tweeted his dissatisfaction with General Motors’ decision to close four US plants. I agree. Trump’s 1950’s framework for analyzing the economy has become outdated. The world is moving on, and investors should move on too. Notwithstanding the pros and cons of the decisions of GM management, here is the message from the market. Jim O’Shaughnessy of O’Shaughness Asset Management highlighted the long-term return differential between the Price to Book factor (red line) and other cash flow factors. Simply put, P/B doesn’t work anymore as a stock selection technique anymore. In the days of our parents and grandparents, investors analyzed companies based on the returns of corporate assets, and how hard management sweated those assets. Those days of companies of using the classic economic inputs of capital, labor, and rents (land) is becoming obsolete, as evidenced by the failure of the P/B factor in stock selection. The next morning, as we hosted joint investor meetings with HK-based clients with my European colleague Harald Hendrikse, we agreed that GM management has accomplished something truly unprecedented: elimination of significant excess capacity from a position of strength before the market downturn. We also agreed that the read-across to the global auto sector is highly significant. GM is conducting a masterclass in how to manage a portfolio of increasingly obsolete businesses. Mary Barra’s leadership strength and strategic acumen are proving to be a valuable asset to shareholders. The GM team’s combination of awareness and action (vision and execution) is an example for OEMs globally that must guide these extremely large, complex, and frequently culturally entrenched organizations into new markets while dismantling parts of the business with potentially negative terminal values. The world has changed, and building plants that employ production workers may not be the best way to compete for many companies in today’s economy. Investors like O’Shaughnessy understand how the world is changing. So does Warren Buffett. Does Trump understand the key drivers of a long-term sustainable competitive advantage, or will he continue to look in the rear-view mirror and focus on the old economic models? Mr. Trump and Democrats seem to believe that with the right mix of tariffs and managed trade they can return to a U.S. economy built on steel and autos. This is the logic behind the Administration stipulating in its new trade agreement with Mexico and Canada that 40% to 45% of a vehicle’s value must consist of parts made by workers earning at least $16 an hour. But an economy doesn’t run on nostalgia. U.S. auto makers don’t fear the new wage mandate because engineering performed by higher-skilled U.S. employees accounts for ever-more of a vehicle’s value. GM could soon become as much a tech company as a manufacturer. Amid a strong economy, most laid-off GM employees should find work. GM may also decide to retool idled factories to produce trucks as Fiat Chrysler has with a plant in Michigan. Old Economy, meet the New Economy. The issue I am raising isn’t about leadership, which I will deal with in a future discussion. The issue is Old vs. New Economy companies and the analytical framework you should use to analyze them. I’m sorry but I beg to differ on the long term analysis of a changing economy. A funny thing happened on the way to this “changing economy.” I still go to Amazon and my local stores and buy hard goods. I haven’t changed in that regard and neither has the rest of the world. What has changed is wage disparity between countries. The reason most of the hard goods we buy are made in other, developing, countries is the result of wage disparity. 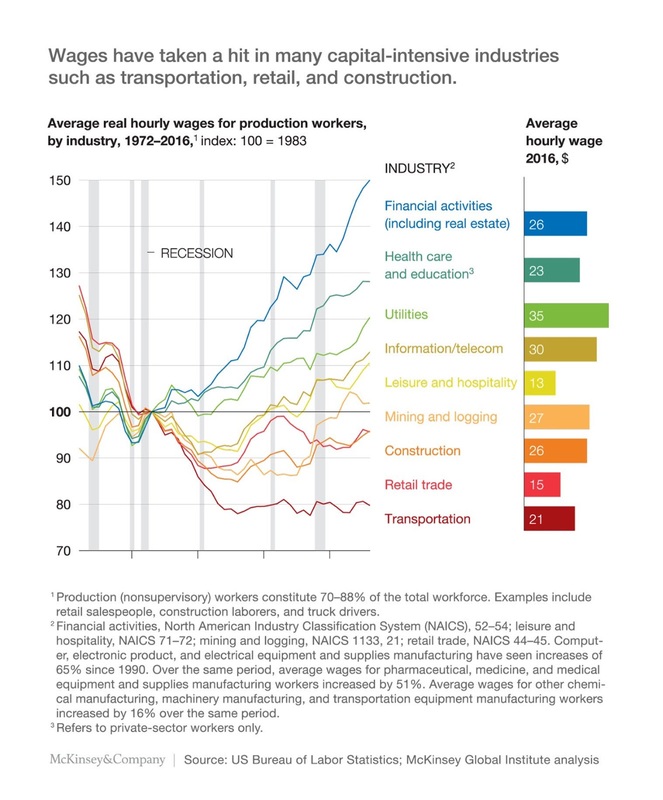 Manufacturing wages in the West are much, much higher than in China and other developing countries. This will NOT be the case forever. Wages are already climbing in China and will eventually close in on parity. And then there is the cost of transportation of goods half way around the world. Cheap oil has further facilitated this disparity in goods manufacture. But, oil isn’t going to be $50 a barrel forever. $200 oil is probably somewhere in our future. Do we have an energy source to replace oil? No. Not even at higher prices. And a third disparity in the equation is the fact that China steal technology, ignores patents and doesn’t play by the rules. They are also abusing tariffs to their advantage. This too will not go on forever. Trump is on the right track. Remove the disparities that he can, notably those in the previous paragraph and begin to bring manufacturing back to America. While we are still at somewhat of a disadvantage with regard to wages, that disparity and others will disappear over time. We should be preparing and striving to keep the roots of manufacturing in the U.S. This isn’t “old economics,” it’s FUTURE economics. It seems too many economists can’t see the forest for the trees. I understand your visceral reaction, but this is not about what is right or wrong, about what is just, but about how to make money. Both the quantitative evidence and the behavioral pattern of smart investors like Buffett indicates that the world has changed, and investors should change with it. The title of the article says it all. Say good bye to 1950s (American manufacturing). Tesla epitomizes what Cam is saying perfectly as an example. Tesla owners love it for the ease of car updates, based on software. As improvements in Tesla come forth, it is “beam me up scottie” via the airwaves. Yes, Marc Andreessen was right, “software is eating the world”. The future is not in making cars the way we did in 1950s but the way Tesla has shown. A hardware, that updates itself on the airwaves. Why did I fire Microsoft from my life and buy Apple? Because, Apple delivers hardware, that maintains itself (no wonder Mr. Buffet bought boat loads of Apple). Microsoft, on the other hand, was demanding more of my time to just maintain its software and the hardware, literally broke off its hinges! So, analog systems (like celluloid movies and polaroid pictures) got killed by digital imaging. X ray films and film makers like Kodak got killed. Analog audio got demolished by digital. Money, soon, will become digital, it is a matter of time. Soon, dumb TVs will be forced to be smart, someone will figure it out. Purchases on Amazon are being made with the least amount of human intervention. In the same vein, I do not understand why cashiers at McDonald’s exist or for that matter why McDonald’s needs humans to take orders, when software can do the job. Furthermore, I also do not completely understand why humans are required to fry potato fries at McDonalds instead of mechanizing the task. The answer to the above is a firm no. Our president, IMHO opinion does not understand this idea. Yes, fair trade is all fine and all that, but using tariffs is a blunt instrument, as we are watching in front of our eyes. Negotiating with China is not exactly negotiating with a supplier of bathroom and other fixtures for Trump tower, now is it? There is more to the story with J&J’s “No more tears” shampoos an example. Like J&J, Proctor and Gamble is likely going to come under fire for its premium products. L Brands and Hanes brands have both experienced powerful deflationary forces unleashed by globalization. President Trump wants to go back to the America, that was. However, globalization, digitization, availability of efficient networks, and robotic manufacturing is the future of America. President does not get it, with or without China. So, with GM, let us also add the example of another iconic American company GE. America bailed out GM, and GM is now struggling to retool itself. Mismanagement has brought GE to its knees. It cut its dividend to raise cash on its books. How shameful. 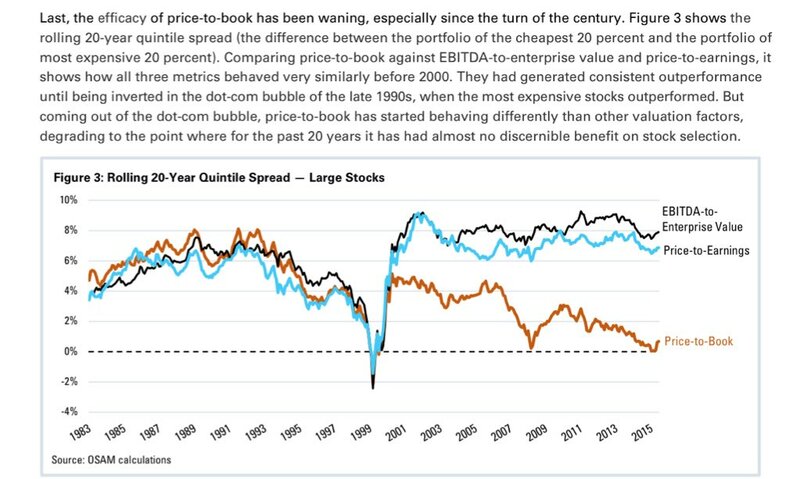 These are examples of old America, old style of valuations (like P/B), simply do not work. What works in valuations is “stickiness” of the platform, like an Apple or Amazon. Even Facebook and Google IMHO are not as sticky as Apple or Amazon. Just my 2 cents. Were it not for the cash burn rate of Netflix, yes it could claim the same moat or stature as an Apple or Amazon. Netflix just sold bonds to raise cash!! Again, very “sticky” company, but not sure how it is going to survive its steep cash burn. As an aside, ATT has 188 billion $ of debt, but has become content king. So, here is old America, that gobbled up content by buying Time Warner, and has beefed up its satellite network by gobbling up dish network a few years ago. Its arch rival, Verizon has only bandwidth, but no content. Usually bandwidth is commodity, so it will be interesting to see if another Old American company called ATT is able to make a successful transition to a new business model or gets crushed under the weight of its debt (like GE). So, the future as Tom Friedman said in his book “The world is flat” is “Cheaper, faster and better”. You, the reader should decide if America is moving to “Cheaper, faster, better” or the opposite, under our current President. I believe intelligence is an irresistible force..dna is intelligence, so is a bacteria that can move. Intelligence has the odds favoring it. Now is it intelligent to make things more expensive to make? After all, the expense is in a sense related to energy. We only have so much. If phones or TVs or clothes cost more, then we buy less units. Machines, houses, you name it they will all get smarter, and the process will accelerate. This is beyond any politician. As we can see here with intelligent people debating these important issues, this is a complex subject. We are seeing in politics around the world, elections of populist governments both far right and left that offer simple solutions that seem right to voters but aren’t backed by science or learned experts. Successful democracies have historically had a method of vetting potential leaders before elections. Potential leaders who appreciated knowledge as opposed to personal hunches. This has changed and not just in America. But of course America is the big fish in the pond. As Michael Lewis’s new book outlines, important agencies of the government are seeing highly qualified experts heading them being fired and amateurs appointed to take over to promote populist ideas. The damage will be huge. Unsuccessful populist governments either elected or put in place by revolution fail because they make economic policies that seem good for the populace but unfortunately don’t work. Then as their economy spirals down, they blame others for their plight. A new Quinnipiac University poll found that most Democrats oppose the tariffs and don’t approve of Trump’s handling of trade policy. Seventy-three percent of Democrats oppose the steel and aluminum tariffs, compared to 20 percent of Republicans and 55 percent of Independents, according to the poll. Cam, great call on the fade the Trump trade talk rally! I was thinking of waiting before fading this rally but your call and the Dow Jones Transport (-2.7% so far) relative strength to Dow yesterday afternoon and this morning suggested otherwise. 73% of democrats are against their #1 political belief: taxing the people ever more to support an ever expanding government. Buffett is a genius for buying apple 5 yrs after Jobs death, and they haven’t had a solid idea since his death. It’s no longer significant to consider value in investing. Ok, that’s it, I’m stopping my subscription to the comedy channel, you guys have got it covered. Exacta buy signal today Cam. Does that change your inner trader’s short-term outlook? Signal is highly marginal. TRIN very high, but VIX term structure only inverted if you round to 2 decimal places. We need more panic. Last time we tested the 2600 level was on 11-26-2018. Another tweet or two from the president will get you there or below and that would be a better entry point on the long side of the ledger. So what is wrong with this picture? A black swan event like the President getting mired in litigation, Watergate style, possible after 1 January, as the House turns democrat.